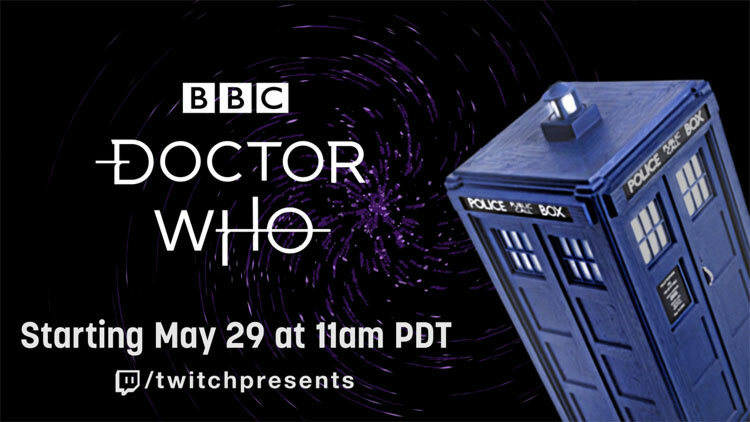 Social video service Twitch has announced it is joining forces with BBC Studios for the first-ever digital broadcasting event of the Classic Doctor Who series. Over 500 episodes from 26 seasons dating from the show’s inception in 1963 until the 1980s will air worldwide over a seven-week period. Starting May 29, fans can tune in each week Monday to Friday at 11 am PDT to catch episodes on Twitch.tv/TwitchPresents. and even a former companion, the Yogscast’s Turps and resident Doctor Who expert and High Roller’s player Matt Toffollo will be discussing why modern audiences should be watching Doctor Who. Each 20-minute episode will provide a brief summary of the stories that are about to be shown, including the actors, monsters, famous phrases or production gaffes to look out for. With first-hand knowledge from former companion Katy Manning (who played Jo Grant the Third Doctor Companion) and writers Bob Baker and Paul Cornell, the shows will give insight into the series alongside the humor and irreverence viewers expect from the Yogscast. Apparently someone is looking in to getting these pre-shows permanently stored somewhere. Which is good, because living in Australia, I’d have to get up at 2-4 am to watch them, and as much as I want to watch them, I’m not staying up that late. Does anyone know if the pre show are going to be repeated or re-uploaded? I’m not going to be available when the 7th Doctor pre show is on. Just my luck that he’s my favourite doctor! They haven’t been repeating it 20 mins before the start of every stream, just at the start of each era. I’m worried that I’ll never get to see it. I know if you have an Xbox you can get twitch. Same here, might have a look though. Re the animated episodes, it could have to do with the studios which animated said stories – The Ice Warriors is (I think) the only one to have been done by Qurios, so perhaps they had a different contract to the other studios, meaning that the BBC are allowed to broadcast it? Or perhaps they’re using telesnaps (I don’t know which episodes have the most coherent telesnap recons but presumably some are more usable than others). The only animated story being aired is The Ice Warriors, so the 60s serials and Shada will be missing for that reason. Five Doctors may be missing due to its unusual runtime (even K9&Co is 45 minutes, which equates to just 2 classic episodes, or 1 from season 22, so we can assume they are able to accommodate for that). Dalek stories and Planet of Fire are anyone’s guess, probably someone involved in the production blocking the rights or demanding a high fee for the episode’s broadcast. I think some of those are missing is because some episodes are animated. We can not focus on those, we still get a lot of good content. I’m surprised it’s not on bbc I player. Out of the 137 stories that have been released, we will only be getting 124 plus K9 and Company. Ive never heard of Twitch. I feel so old!